Stocks are taking a breather after a ferocious two-day rally. Bonds and MBS are up. Initial Jobless Claims came in at 268k, up 9k from the previous week. Claims have now been below 300k for a year, which is an astounding run. 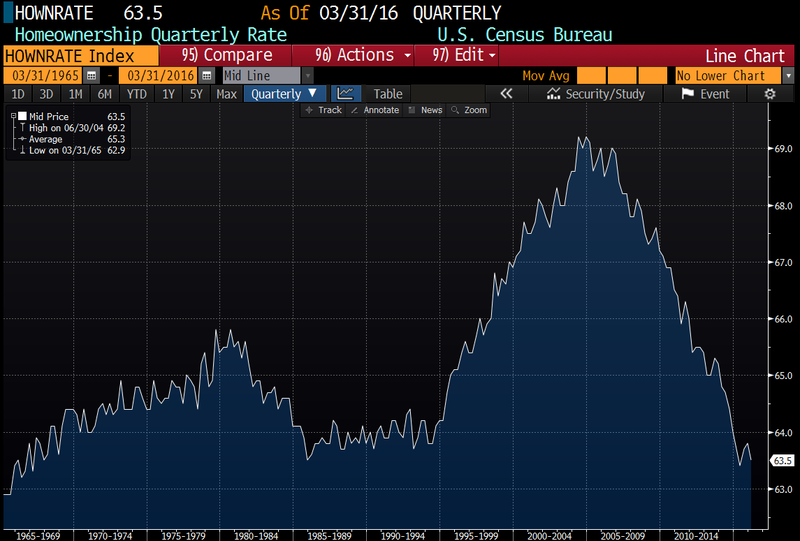 In other economic data, the Chicago Purchasing manager index rose while the Bloomberg Consumer Comfort index fell. Last night, the Fed released the results of its stress tests and most, if not all, US banks passed. After the close, the tape was dominated by news of banks raising dividends and buybacks. Deutsche Bank failed to pass. Deutsche Bank’s market cap stands at just under $19 billion, roughly the same size as M&T or Suntrust. Citi’s market cap is $123 billion. This gives you an idea how hard the banking system has been rocked in Europe. George Soros believes Brexit will be the catalyst to unleash a financial markets crisis. He believes it will be concentrated in Europe, where their economies are stuck in a deflationary trap, similar to Japan. His prescription is for European governments to adopt deficit spending en masse to boost aggregate demand. Of course Japan has been doing exactly that for over 25 years. All they have to show for it is negative interest rates, flat GDP and a debt to GDP ratio of 2.2x. He is also predicting a hard landing in China, which would add fuel to the fire. Punch line: Deflationary forces emanating out of Asia and Europe will keep the US dollar strong (which will dampen inflation in the US) and interest rates low. When talking about interest rates, it is important to remember that interest rate cycles are long. Below is a chart of long term Treasury yields in the US going back 90 years. The relevant comparison for the global economy right now is the 1930s. The crash was in 1929, (versus 2008) and rates kept falling for another 11 years. It looks like rates bottomed around 1940. Rates remained unusually low until the late 1950s. To put a parallel on that, we would be looking for rates to bottom out somewhere around 2020, and then have another 10 years where these exceptionally low rates increased only gradually. Note the trough-to-peak time was about 40 years. Of course history doesn’t repeat – it only rhymes, however those looking for a cataclysmic top in the bond market might be waiting a while. Fun fact: There are now $11.7 trillion worth of bonds with negative yields right now. The notional amount of bonds with negative yields and maturities of 7 years or longer is $2.6 trillion. This number has doubled since April. The UK 10 year is still positive, yielding .95%, but who knows how long that will last. This is the thing to keep in mind: with global rates near or below zero, there will be a natural bid for Treasuries. It is inevitable as global investors sell bonds yielding nothing to buy bonds yielding something. Stocks are higher this morning as global stocks and commodities rally. Bonds and MBS are flat. It seems like the big Brexit-related sell-off might be over. Brexit will have a negligible effect on US corporate earnings, and stocks will benefit from a lower, steadier interest rate environment. I would look for the correlation between US stocks and global stocks to break down gradually. I am not sure we will see the same effect in the Treasury markets as the global bond market is simply much more integrated. Speaking of which, global bond yields are holding steady this morning, with the German Bund at -11 basis points and the the PIIGS slightly lower. First quarter GDP was revised to +1.1%. while personal consumption came in at 1.5% and the PCE index (the inflation measure preferred by the Fed came in at 0.4%). 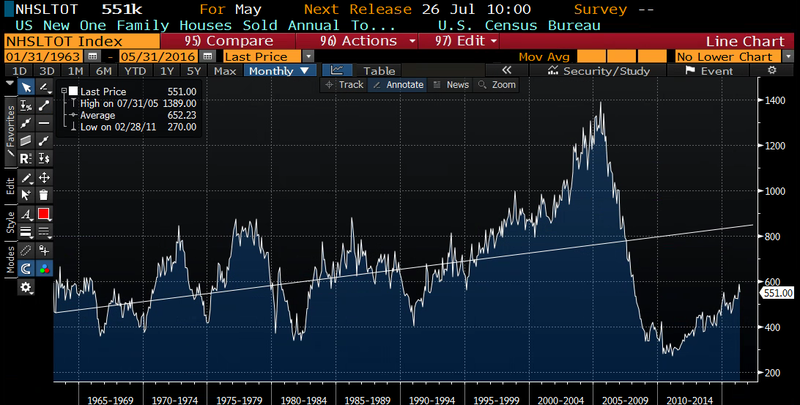 Housing as a percentage of GDP increased. I have long said the difference between this sub-par economy and a strong one is housing. Politicians have yet to figure this out. Home prices rose .5% MOM and 5.4%YOY, according to the Case-Shiller home price index. Home prices in 7 MSAs (Denver, Dallas, Portland OR, San Francisco, Seattle, Charlotte, and Boston) have eclipsed their 2006 peaks. Personal Incomes rose 0.2% in May, slightly below forecasts, while personal spending increased 0.4%, right in line with expectations. For the month, the PCE core index rose 1.6% YOY, which is still below the Fed’s target of 2%. Mortgage Applications fell 2.6% last week as purchases fell 3% and refis fell 2.4%. Pending Home Sales fell 3.7% MOM in May and are up 2.4% YOY. The Fed is scheduled to release the results of its stress tests for the largest US banks. The results should come out after the close. Billions of dollars in dividends and buybacks are on the line. Separately, GE’s systemic designation has been rescinded by US regulators. GE is the first institution to have the designation removed, which requires stringent capital and leverage requirements. GE has sold much of its GE Financial division, and has returned to its roots as an industrial manufacturer. Speaking of banking crises, the European big banks have stabilized in the aftermath of Brexit. The canaries in the coal mine are Deutsche Bank and Unicredito. Even Barclay’s and RBS have stabilized. The thing to keep in mind is that the banks now have almost double the capital they had in 2008 and Brexit is nothing like the bursting of the US residential real estate bubble. The Bernank agrees. Freddie Mac wonders if the homeownership rate can fall below 50%. The current level is at 63.5%, which is the lowest in 22 years, and just off the low of 63%, which goes back to 1965, when Census started tracking the statistic. They look at 3 studies, which all predict lower homeownership going forward. The factors inhibiting an increase in homeownership are lower income growth, high rental prices, tight supply and and high student loan debt / tight credit. It is hard to tell what a “normal” homeownership rate as the 2005 spike was the result of a bubble and a lot of social engineering via the housing market, which really started early in the Clinton Administration. Stocks are lower this morning as markets adjust to Brexit. Bonds and MBS are up. Here is the summary of the financial market reaction to Brexit: Stocks down, Treasuries up, US dollar up, Gold up, but other commodities down. Fed Funds futures pricing in no more interest rate hikes this year. In many ways, markets were discounting #Bremain in the week or so heading up to the vote, so in many cases, they merely gave back those moves. Friday was volatile, with 3-sigma moves seen in 23 currencies, 30 sovereign bonds, and and 28 stock market indices. What does Brexit mean to the European financial markets? The banks got crushed on Friday, and part of that is due to widening sovereign spreads. Brexit caused a yield divergence between the German Bund and the PIIGS (Portugal, Italy, Ireland, Greece, and Spain) bonds. Greek spreads widened out 89 basis points to 8.65%. German bond yields fell 14 basis points to -5 basis points. While yields on the PIIGS are still low, they could become an issue going forward. The biggest risk to the US is any sort of financial contagion. The tell will be the performance of the European and UK banks. Note Italy is considering injecting 50 billion euros into its banking system. The PIIGS are behaving this morning, but that will be something to watch. Brexit has put the Fed in a box. The slowing economy in China plus the issues with Brexit have pretty much put them on the sidelines for now. In fact, the Fed Funds futures are beginning to price in the possibility of a rate cut. The bottom line is that rates will be lower for longer. FWIW, Bill Gross thinks the upside is limited in US bonds. While Brexit will probably dampen global growth slightly, it shouldn’t be a catalyst to push the US into a recession. The biggest beneficiaries will be tourists who want to visit the UK this summer. The biggest losers will be US manufacturers who compete with UK manufacturers and become less competitive due to the sell-off in the pound. In other words, the economic fall-out to the US will probably be pretty limited. Perhaps US stocks were looking for a reason to sell off, but the effect of Brexit on US corporate earnings should be pretty small. In terms of the mortgage markets, the TBA market (which sets mortgage rates) really didn’t have much of a move on Friday. Ginnie II 3.5s were up about 1/4 of a point, which is more or less normal volatility. Fannie TBAs were up 3/8 of a point, which again is more or less normal volatility. Historically, TBAs have lagged movements in the bond markets, and days like Friday absolutely annihilate people who hedge MBS interest rate risk. So, while their portfolio goes up in value, their interest rate hedges lose a lot more than their book gains, so it ends up pressuring TBA pricing, which in turn prevents mortgage rates from moving as low as you think they should go. If the 10 year stays right here, expect mortgage rates to catch up only gradually over a week or even two. Note that the Bankrate US 30 year fixed rate mortgage had been lagging the moves downward in rates already, even before the big move on Friday. It dropped 11 basis points on Friday. Construction wages are rising faster than the rest of the industry, however they are really just playing catch-up. It will make new houses marginally more expensive, however falling mortgage rates will cushion the blow. Stocks are getting sold this morning after the UK voted to leave the EU. Bonds and MBS are up. Last night the UK voted to leave the EU, which was a surprise to the markets. European stocks are getting crushed this morning, and the biggest ones taking a hit are the banks. Barclay’s is down 17%, Santander is down 18%, for example, so there is the distinct possibility of some sort of banking crisis over there. Note we are not seeing a huge move in US banks, so it looks like any crisis over there isn’t going to spill over to the US banking sector. Big picture: The Fed is doing nothing – in fact there will be calls for the next move to be a rate cut. This could cause a mild recession over here, which means lower rates. In fact, durable goods orders were terrible this morning, down 2.2%. One of the big investment banks was calling for a 1.4% 10 year bond yield if the UK left. The 2 year bond yield dropped 14 basis points to 64 bps, That will be the one to watch to get a read on what the market thinks the Fed will do. In terms of mortgage rates, the TBAs (which determine mortgage rates) will lag the move downward in yields. For example, the Fannie Mae TBAs are up this morning, but nowhere near the move in bonds. So, while the 10 year bond yield will get everybody excited, don’t expect a huge move downward in mortgage rates, at least initially. Once the 10 year finds its level, TBAs will find their level, probably over the next few weeks or so. If the European banking system goes into full crisis mode, the impact on mortgage rates will probably be a pull-back in jumbo pricing, which is the most vulnerable since it relies on a private securitization market. FN and GN pricing should not be affected. So basically, we will see some drama in the stock and bond markets, and not so much in the mortgage markets. The UK voted to leave the European Union last night, 52% to 48%. taking the market by surprise. All markets had discounted the possibility of a Leave vote going into the referendum, resulting is massive market moves once it became clear that Leave had won the day. The GBP dropped nearly 14% at one point, from 1.49 down to 1.30. It is currently back up to 1.39. Rates across the globe have rallied. The UST 10yr note is currently at 1.54%, and traded as low as 1.42%, after closing yesterday at 1.73%. German 10yr bonds are back into negative yield territory, having dropped to -.15%, although they have since sold off back to -.07%. Stock markets have been crushed. The FTSE is down 271 points (4.3%) but is off the lows, having opened up down almost 600 points. Dow and S&P futures are down 472 and 71 points respectively. The UK financial sector has been hit particularly hard. Barclays and RBS were each down nearly 30% at one point. Eurpoean banks are down roughly 8% across the board. Prime Minister David Cameron has already resigned. It is unclear who will replace him atop the Conservative Party, or whether he will call for a national election, but former London mayor Boris Johnson, who was a vocal Leave supporter, certainly has to be looking good. Populist leaders across Europe, from Sweden to France, are already calling for similar referendums in their own countries, although the likelihood of it happening any time soon is remote, especially given the complicating factor of the single currency, which the UK was never a part of. More probable is that people will wait to see how Britain’s exit plays out. But clearly this is a bad sign for the future of the European project. Markets are higher this morning as the Brexit vote happens in the UK. Bonds and MBS are down. Last night, the Sporting Index Brexit Markets were tilted towards Remain at 53-47. If the UK leaves, it probably won’t have much of an effect on the US economy, however it will probably cause a flight to safety, meaning US Treasury yields would fall. Tight supply of starter homes are pushing prices up 9% per year in that segment, more than double the price appreciation at the high end. This is a combination of lower foreign demand for luxury homes and increasing demand by Millennials who want to buy. Initial Jobless Claims fell to 259k last week. For all the talk about a slowdown in the labor markets, you aren’t seeing any evidence of layoffs. The Chicago Fed National Activity Index turned negative last month, while the Kansas City Fed Index turned positive. Finally, the Index of Leading Economic Indicators turned negative last month. The 20 hottest real estate markets, according to Realtor.com. No, it isn’t Phoenix, Palm Springs, Vegas, and Orange County. Note how many are in the Rust Belt! The D is supposedly a hot market – I thought they were going to abandon about 1/3 of the city and turn it back into farmland. Markets are flattish ahead of the Brexit vote tomorrow. Bonds and MBS are down small. Mortgage Applications rose 2.9% last week as purchases fell 2.4% and refis rose 6.5%. Refis rose to 57.7% of all loans as rates bombed out on the FOMC decision. The FHFA House Price index rose 0.2% in April, and is up 5.9% year-over-year. Interestingly, New England went from cellar-dweller to the leader in monthly price appreciation. The region is still lagging the most on a YOY basis however. The FHFA index is the only housing price index that has regained all of the losses from the crisis. This is because it concentrates only on houses with a conforming mortgage, so it ignores the all-cash distressed sales and the jumbo space. Existing home sales rose 1.8% in May to 5.53 million. This is the highest pace since February 2007. The median house price was $239,700 up 4.7% YOY. Total housing inventory is at 2.15 million units, which represents a 4.7 month supply. Inventory is still tight. The first time homebuyer accounted for 30% of all sales, a decrease from last month and last year. Days on market dropped to 32 days, a record. On Lennar’s earnings conference call, CEO Stuart Miller summed up Lennar’s view of the housing market. In a way, he also explained why housing starts remain so low. “As we’ve noted consistently over the past years, the overall housing market has been generally defined by a rather large production deficit that has continued to grow over the past years. While questions have been raised as to the real normalized levels of production that are required to serve the U.S. current population, we believe that production levels in the 1 million to 1.2 million starts per year range are still too low for the needs of American household growth that is now normalizing.While measuring current production levels against historical norms of 1.5 million starts per year might be flawed logic as there may be a new normal, we believe that the very low inventory levels in existing and new homes and the low vacancy rates and high and growing rental rates for apartments indicate that we are in short supply nationally. The idea of a “new normal” being somewhere above current production levels (1.2 million units) and the historical average (1.5 million units) is as good an explanation as any. Lennar mentioned on their call that they have been transitioning from the early growth phase of the cycle to the mature phase of the cycle. In other words, they aren’t looking for the typical 2 million level of starts you usually see in the recovery from a recession. 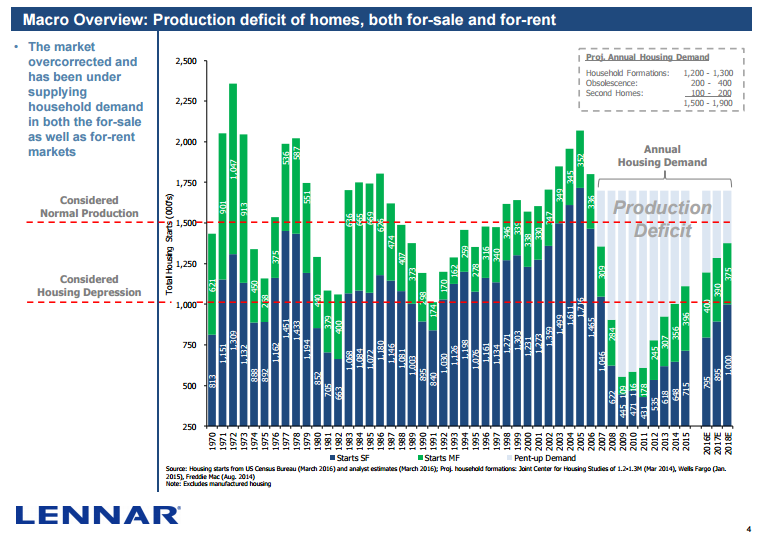 They do give a good graphic analysis of the supply / demand state of the housing market in this slide from a recent JP Morgan housing conference. Notice that the current level of production (sub 1.2 million units is closer to the the “housing depression” line than the “normal production” line. That would make 2009-2012 “nuclear winter.” Lennar is making the same bet a lot of other builders are making that multi-fam is the way to go as they see the Millennials happy to rent. Actually, the meta-bet they (and everyone else in the financial markets) are making is that inflation is gone, dead, buried, and never, ever, ever coming back. The only reason why you would lend money to the government for no return is that you think inflation is gone. It truly is a “this time is different” argument, which is the most dangerous argument in all of investing. Especially when every central bank on the planet is on a mission to create inflation. Inflation is a debtor’s best friend, and if the Millennials can get out from under their student loan debt, we should see a bull rush for new SFR housing. The cautious homebuilders will probably be caught with too little inventory, and will suddenly start bidding against each other for workers, land and materials. And that is how recessions end. KB Home also reported earnings last night. Earnings were better than expected, and they see a return of the first time homebuyer. Note that the current number of first time homebuyers (30%) is well below the historical average of 40%. Average selling prices were up 2%, which is much lower than the other builders.